The 81st episode of THE FIRE AND WATER PODCAST is now available for your listening pleasure! THE FIRE AND WATER PODCAST is the official podcast of FIRESTORM FAN and THE AQUAMAN SHRINE. This episode is all about YOU the listener! Rob and I start the episode chatting about an upcoming Firestorm action figure, then we turn it over to YOUR feedback! You can find the 81st episode of THE FIRE AND WATER PODCAST on iTunes. While you’re there, please drop us a review on the iTunes page. Every comment helps! Alternatively, you may download the podcast by right-clicking here, choosing “Save Target/Link As”, and selecting a location on your computer to save the file (40 MB). thanks for the quick shout out for the Gerry Conway dvd. here is the website, for the dvd. the site is still a work in progress, but you can buy signed and unsigned copies there. 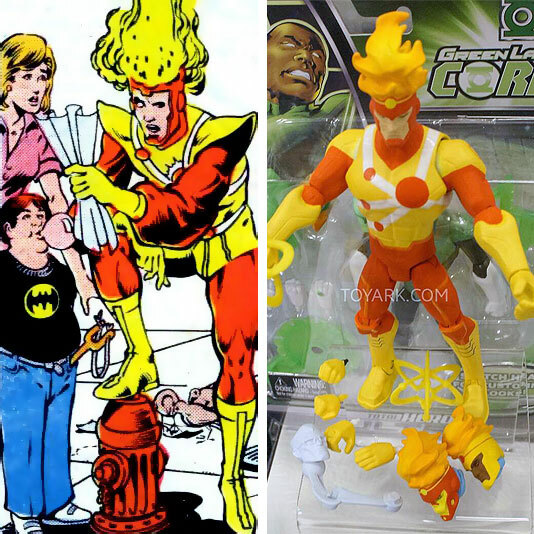 and yeah, i too cannot wait for that new firestorm figure!!! I’m so embarrassed. While recording this episode, I mentioned Sebastian Bach from Skid Row. Unfortunately, I had comic books on the brain a little too much because I said “Sebastian Shaw”. Headbanger card revoked! I really do dig that Total Heroes Firestorm figure, even though I am not a big buyer of DCU toys nor Firestorm in general. But it espouses a lot of the same collector-aimed design aspects which I really appreciate in some of the Japanese toy lines I follow. The head swaps, hand swaps, and extra accessories (floating head of Professor Stein!) all tie these sorts of figures thematically with Tamashii Nations (which is a Bandai subsidiary) lines S.H. Figuarts (which typically showcases characters from the Super Sentai series, Kamen Rider series, and other tokusatsu/live action science-fiction shows, but has had offerings as varied as Iron Man and War Machine from IM2 and both members of Daft Punk), D-Arts (which is like S.H. Figuarts, but for animated characters), and Ultra-Act (a larger scale line which covers the Ultra series). Similarly, lines such as Revoltech and PlayArts Kai, also offer this level of sophistication. Now, admittedly, you are going to pay for those features. But if you are a toy collector, I think it’s better to pay a bit more for your figure and have it be much more dynamic in how you can pose it and customizable in how you display it than a regular retail toy. Having a “collector aimed” figure which is pricier and a “mass market” figure which is cheaper is a better solution than either a) offering only a complex, pricey figure which is too fragile/too expensive/doesn’t pass choke gate regulations for kids or b) offering only a sturdy, simple toy which doesn’t have the level of detail a collector wants. Having both available means that (for example) Daddy or Mommy can have “their” Firestorm on the shelf by their desk which the kids can play with “their” Firestorm in the play room. I have this very situation going on in my house right now; for instance, my boys have a Playskool Hawkman toy that they play with (along with many other Justice Leaguers and Avengers… and Doctor Doom for good measure), but Daddy has his “Hawkmans” on his shelf upstairs. The big pricepoint of these figures is a sticking point for a lot of people, and I can understand that. I marvel at some folks who buy every single release of a certain line, at $30 or more a pop. I can only assume they are young and have disposable income. I don’t mind paying that price once in a while but I have to restrain myself — I swore off S.H. Figuarts after buying my Mighty Morphin’ Power Rangers Green Ranger and White Ranger. Which means I had to force myself not to buy the MMPR Yellow Ranger (the US exclusive version has a female body and OH MY GOD I WANT THIS SO BAD), and Kamen Rider Black RX (my first Kamen Rider series) and his motorcycle (SO COOL). It all adds up much too fast! Losers: Great pick Rob, I have that short Omnibus and love it. It’s Kirby’s 70s idea of war comics, so it mixes in everything comic book related ever. Super-Sons: Great pick too, Shag! Bob Haney is the KING of odd teen speak. He deserves his own podcast series. Beautiful pronunciation on Québécois, Shag! isn’t Sebastian Shaw the actor playing bucky/winter soldier in the captain america movies? that new one looks awesome!!! and filmed mostly in cleveland!!! Hey guys, another fun Listener’s feedback episode. Keep up the great work, always a fun listen. I like the listener feedback shows! And with each show my likeness grows! Rob and Shag, I like Who’s Who! Power Records, Hero Points, and geek talk too! Issue recaps and commentary’s great! With every weekend I just can’t wait! To check iTunes, and both sites too, I like this podcast, yes I do! And so ends my Seussy chatter, did you like it? Does it matter? I know now what I must do, to hear my name read ‘loud by you! And it’s not just some mindless prattle…I know I’m a nuclear sub…and Shag likes knowing that knowing’s half the battle!